Known for high-quality milk that has has higher levels of protein, calcium and butterfat than milk from other cows, the Jersey cow's gentle ways and efficient conversion of feed to milk make it a desirable choice for homesteaders. The breed is less susceptible to disease and lameness than other breeds, and tends to produce and live longer than other cattle on average. While most cattle live between 18 to 22 years, it's not unusual for Jerseys to live 25 years or more. 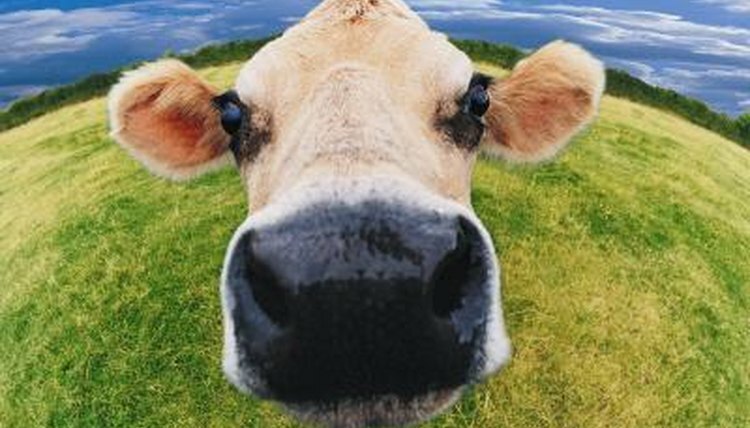 The oldest Jersey cow recorded was 37 years old living at an animal rescue center in the United Kingdom. Jersey cows reach productive age earlier -- often bearing a calf months earlier than other dairy breeds. Life span depends largely on the conditions under which a Jersey cow is kept. Homestead cattle fed on pasture will live longer, healthier lives than grain-fed cows. Jerseys in commercial dairy herds eating primarily grain and fodder do not live as long as those raised on homesteads, and most find their way to slaughterhouses by 7 years of age. This is Jersey: Is Dolly the Oldest Cow in the World?